By Scott Gilfoid: Naoya ‘Monster’ Inoue says he plans on dropping WBA World bantamweight champion Jaime McDonnell with a single shot this Friday. The 5’5” Inoue (15-0, 13 KOs) plans on knocking the taller 5’10” McDonnell (29-2-1, 13 KOs) down to size when they face each other at the Ota-City General Gymnasium in Tokyo, Japan. It had to been difficult for Inoue to find sparring partners tall enough to prepare him for the height and reach of McDonnell. Most fighters that are 5’10”, are a lot bigger than McDonnell, so they probably wouldn’t have been much good in helping Inoue prepare for the fight. McDonnell does a poor job of keeping his shorter opponents from getting inside on him. He’s often fighting in punching range of his shorter-armed opponents. The reason why McDonnell has been so effusive during his career is a combination of him throwing lots of punches and the not facing dangerous guys that could potentially beat him. The best fighter McDonnell has faced during his career is Liborio Solis, and he appeared to lose every round against him in their first fight in 2016. McDonnell hasn’t fought the truly dangerous fighters in the 118lb weight class like Luis Nery, Emmanuel Rodriguez and Zolani Tete. Those guys would really give McDonnell problems if he fought them. He’s been wise not to tangle with any of them. 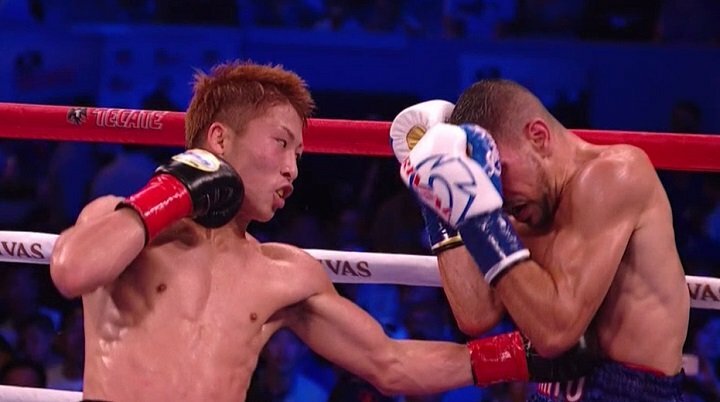 Inoue knocks a lot of guys out with body shots. He’s going to have a lot of body to work on against the 5’10” McDonnell on Friday night. It’s smart of Inoue to be thinking of targeting McDonnell’s midsection for his punches because it’s hard to generate punching power on a guy that is so tall. This is by far the tallest opponent that the Japanese fighter Inoue has faced during his six-year pro career in fighting at light flyweight and super flyweight. You don’t see lanky 5’10” fighters in those weight classes because it’s too thin and weak. McDonell is weak for the bantamweight class, but somehow he was able to capture the World Boxing Association ‘regular’ 118lb title in 2014 and hold onto it for the last 4 years in winning 5 fights in 6 title defenses. You can argue that McDonnell got a little help with the judging in his first fight with Liborio Solis in November2016 in winning a 12 round decision that he probably should have lost badly. The scoring was a life saver for McDonnell, because not only did he get the win in a fight that he appeared to lose by 12-0 score, he won it by a lopsided score. Even McDonnell’s own fans were booing the results of that fight. McDonnell hasn’t looked good in a fight in a long, long time since his 9th round knockout win over journeyman Fernando Vargas (32-14-3, 21 KOs) in April 2016. That was 2 years ago. Since then, McDonnell has a controversial 12 round unanimous decision victory over Liborio Solis in November 2016, and a 3rd round no decision over Solis in November 2017. For some reason, McDonnell let a year elapse between his first fight with Solis in 2016 before facing him last November. That’s not the smartest thing for McDonnell to have done. But you can’t blame McDonnell for not choosing to get back into the ring with Solis quickly because he has so many problems with him. If Inoue defeats McDonnell to capture his third division world title, he then plans on entering the World Boxing Super Series bantamweight tournament and competing with the likes of Ryan Burnett, Emmanuel Rodriguez and Zolani Tete. If the 25-year-old Inoue is the real deal at 118, then he’ll get a shot to prove it by facing those guys. It’s unlikely that Inoue will get a chance to fight both Rodriguez and Tete, as they’re probably going to face each other before he has to mix it up with one of them. Burnett would seem to be the weak link among the names that are being mentioned as joining the tournament. What we don’t know is whether Inoue’s punching power will carry up to the 118 lb. weight class from when he was fighting at 115 and holding down the World Boxing Organization super flyweight title. It’s only 3 lbs. difference between the super flyweight and bantamweight divisions, but that’s still a lot of weight for fighters that size. Inoue’s punching power might not be as formidable at 118, and if that’s the case, then he’s going to figure out a different way to win his fights rather than counting on knocking all of his opponents out each time he fights. It’ll be a different story for Inoue. Moving up in weight to 118 is a good thing no doubt for Inoue, but how in the world do you move up in weight without having fought any of the above list? I’m trying to understand it but I can’t. The only logical conclusion I can come to is Inoue didn’t fancy the idea of facing any of those guys, because they would have been tough outs for him, especially Rungvisai. That guy is a huge puncher, and he would have gone to war with Inoue. If Carmona was able to put hands on Inoue for 12 rounds, just imagine what Rungivisai would have been able to do in landing his shots for 12 rounds.